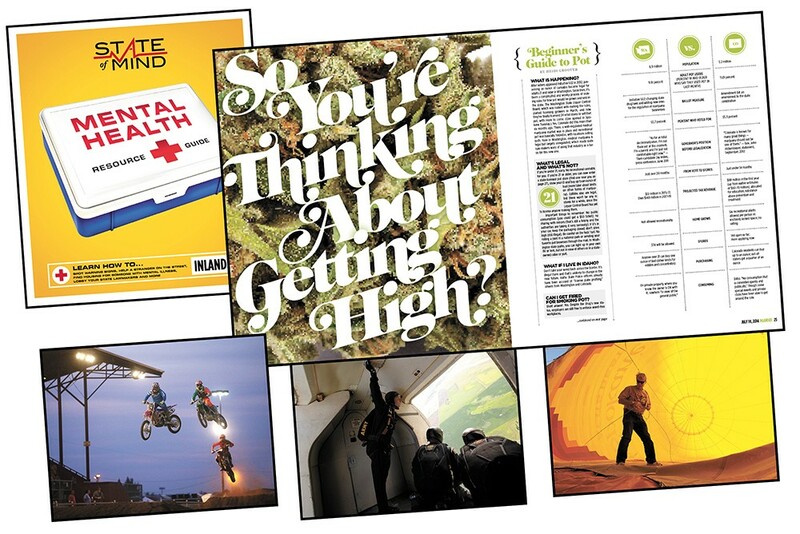 The Inlander's "State of Mind" series, Art Director Chris Bovey's "So You're Thinking About Getting High?" layout design and Young Kwak's photographs all won first place awards from the Association of Alternative Newsmedia earlier this month. Last year, in our State of Mind series, the Inlander dove deep into our region's struggles with treating mental illness. We wrote about prisoners being denied access to their prescription drugs. We revealed how rural Idaho families had to drive hours, and wait months, to find psychiatric care for their children. We reported on the role that mental illness — and serious systemic flaws — played in one woman's suicide and another woman's murder. All that reporting had an impact. One story sparked a class-action lawsuit and a contempt finding. Another helped free a patient found to be neither dangerous nor mentally ill. The story of murder victim Sheena Henderson inspired the Washington State Legislature to pass "Sheena's Law," requiring officials to notify family members if a firearm is going to be returned to a potentially dangerous person. In the legislature's final budget agreement this summer, about $100 million was restored to mental health programs, particularly aiding underfunded regional support networks. Competing against other non-daily publications across the nation, our mental health coverage won a first-place Sigma Delta Chi Award for Public Service Journalism from the Society of Professional Journalists. Jacob Jones' reporting on the messy intersection of mental illness and the criminal justice system, meanwhile, also won him the 2014 Washington Mental Health Reporting Award. And earlier this month, facing off against the nation's largest weekly newspapers, the Inlander's State of Mind series took home the Association of Alternative Newsmedia's first place award for Public Service journalism. Third place, Music Writing, Laura Johnson. Johnson's music stories examined local hip-hop band Flying Spiders in the aftermath of frontman Isamu Jordan's suicide; a legendary 73-year-old jazz musician; and a middle-aged Sir Mix-A-Lot. Second place, Illustration, Jeff Drew. Given stories about research from local universities, Drew turned out vivid images of a principal saving a drowning student; three generations of women weaving DNA strands together; and a giant cow pooping out plastic bricks. First place, Layout, Chris Bovey. Bovey's "So You're thinking About Getting High?" layout design introduced Washington residents to the new world of legal marijuana by splitting up the section into easy-to-browse charts, small stories and FAQs, complete with crisp logos.